What Are the Odds That You’ll Survive the Next Price Shock? Don’t you wonder, when you invest in the stock market, “What are the odds that I’ll be successful?” and “What are the odds that I’ll be wiped out by some price shock?” Actually, it sounds better when it’s in a positive way, but it’s just the other side of the old “risk of ruin.” If there is a 25% chance of reaching the maximum you are willing to risk, then there is a 75% chance of achieving your portfolio objective, and that sounds better. If you can express your risk as a probability, say a 20% chance of losing 15%, or a 5% chance of losing 25%, then you have a much better idea of the investment risk. Risk goes down sharply if you’re willing to accept a larger drawdown. On the other hand, the risk increases a lot if you are only willing to lose 5% or 10%. Regardless of you risk tolerance, you need to find the risk of investing in various stocks, or ETFs, or even a managed portfolio, in order to choose which works best with your investment goals. Using everyone’s favorite market, the SPDR ETF SPY, starting in September 1998, we can plot the chance of losing 10%, 20%, and 50% of your investment, shown in Chart 1. We should remember that, between November 2007 and March 2009, the S&P Index dropped about 50%. From September 2000 until October 2002, the S&P dropped 41% while the Nasdaq 100 dropped 81%. Chart 1. Based on the monthly SPY returns from September 1998, this chart shows the risk of losing 10%, 20%, and 50% of your investment. This is a reminder that the market has periodic, significant risk. Had we assessed risk before the financial crisis, it would have seemed less, but still risky. However, if you invest now, which includes the ups and down of the dot.com bubble and the financial crisis, there is a 30% chance of losing 10% and a 9% chance of losing 20%. As time goes by, there are more small drawdowns; the large drawdowns become a smaller part of history, there is (statistically) a smaller chance of their recurring. If that were not true, we would need to worry about a 1929 crash every day. You have a choice of where to put your investment. Say you’re deciding today between SPY, QQQ, and AAPL. Which has the least chance of loss? It should not be a surprise that the answer is Apple, shown in Chart 2. Nasdaq (QQQ) has far more risk, SPY much less, and AAPL apparently very little. But then, numbers can be deceiving. We need to look at risk from a few different time frames to understand it better. Chart 2. 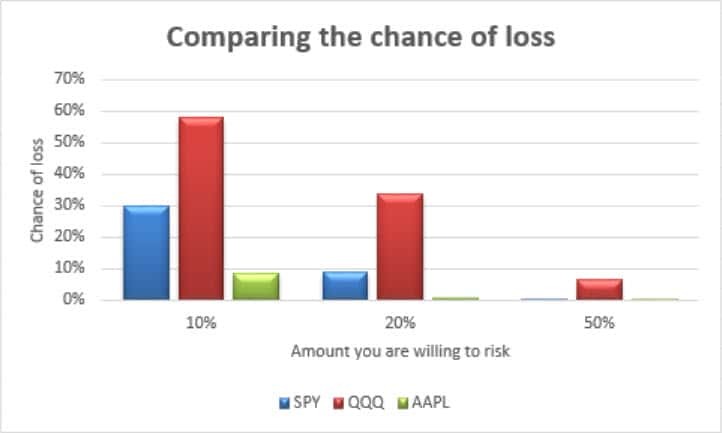 Comparing the risk of loss from SPY, QQQ. And AAPL, if you invested now, based on prices from 1998. Bank of American has had its share of volatility, soaring to near $50 in 2007, then plummeting to single digits in 2008 (see Chart 3). There were days when we weren’t sure if it would be delisted. 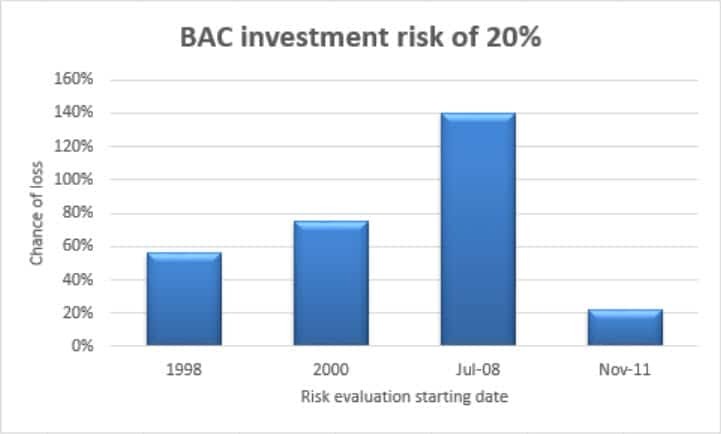 If we consider all the price history (from 1998), an investment now would have a 55% chance of losing 20%, or a 23% chance of losing 50% (not shown on Chart 4). If we consider data that started in 2000, just ahead of the bear market, our chances of losing 20% are now 74%. And, if we started the analysis just ahead of the financial crisis, our risk would appear to be 140%, or a complete loss of our investment. Where we start the analysis is important. Normally, more data is better. Chart 3. Bank of America price volatility. Chart 4. Bank of America chance of loss bases on analysis starting on different dates. But let’s say we don’t expect another financial crisis for a while. 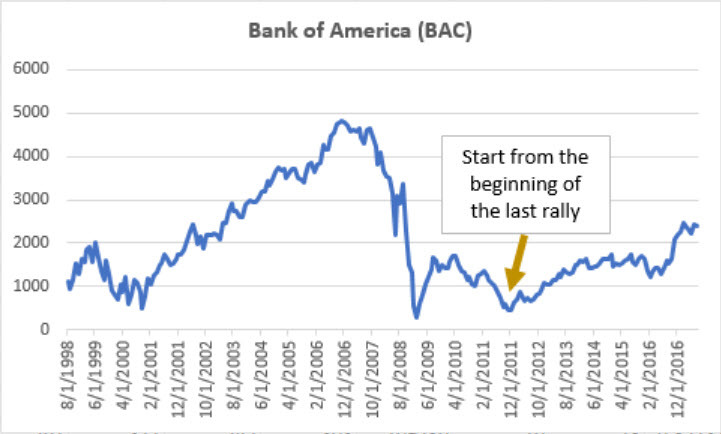 We also think, based on fundamentals, that Bank of America is on the recovery, along with other financial institutions, and that data starting in November 2011 is going to be more representative of how we see the future. Then the risk of losing 20% is now down to 22%. It’s still high, but far lower than any other period shown in Chart 4. If you are willing to risk 50% of your investment, unfortunately a more realistic expectation, your risk based on data from 2011 falls to 2.35%, quite small. There is a saying in statistics, “Torture the numbers and they tell you anything.” Did we just manipulate the Bank of America data so that we ended with a nice result? Given the data that you choose, the results can be optimistic but unrealistic. Is it fair to look at data only from November 2011? While I don’t expect another financial crisis as we saw in 2008, it is not out of the question. Certainly, a drawdown of 20% is normal, and larger drawdowns happen more often than we would like to admit. If we used all our data from 1998, the chance of losing 20% is 55%, but the chance of losing 50% is 23%. I can still live with that. Historic data is more complicated than just one bad drawdown. It includes many small reversals that seem to get ignored when you see the bigger drops of 2000 and 2008, but they still count when you assess risk. Don’t forget, if you use a leveraged ETF, say two times, you double the chance of loss even while you double the returns. Also remember that we used monthly returns, which may not reflect the worst drawdowns or the best prices, if they occurred in the middle of the month. Risk could actually be higher. Being able to compare the risk of different assets, should make your investment decisions better. 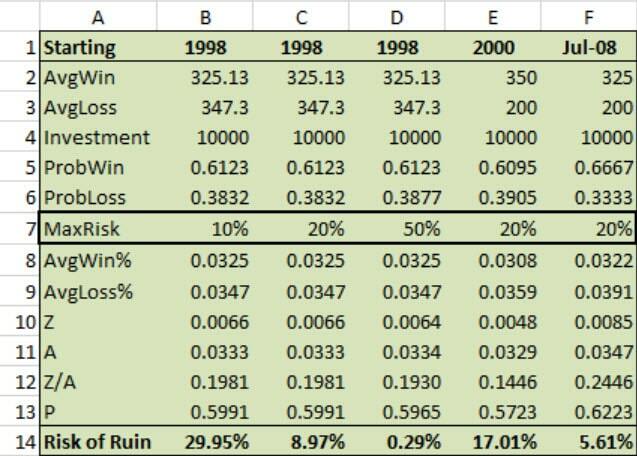 Calculating the Risk of Ruin can be done easily in a spreadsheet. Table 1 shows the results for SPY. We started with monthly returns (you can easily download these in Excel format from Yahoo) and calculated the average return in a winning month (row 2) and the average return in a losing month (row 3, as a positive number). We also calculated the percentage of winning and losing months. You decide the percentage maximum risk (row 7). Table 1. 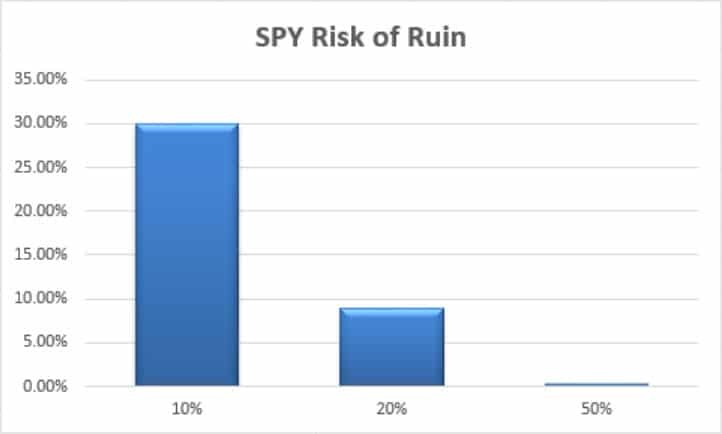 SPY risk of ruin calculations. By comparing the results of different assets over the same time period, and using the same level of risk, row 14 will show you the probability of loss. The lower, the better. To get a measure of return for risk, divide the annualized returns by the risk of ruin. The higher the ratio, the better the choice.